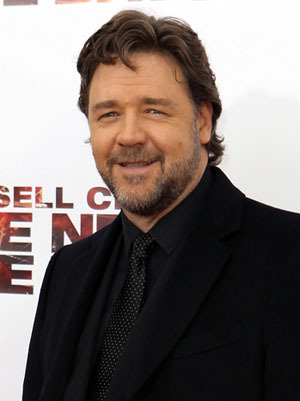 Russell Crowe is determined to bring his family "back together"
The 48-year-old actor split from wife Danielle Spencer - with whom he has two children, Charles, eight, and six-year-old Tennyson - in October but says once he's finished promoting 'Les Miserables' and shooting new film 'Winter's Tale he will concentrate on sorting his personal life out. He wrote on Twitter: "As soon as I finish this job and can get home, my priority is to try to bring my family back together." Russell also hit out at rumours he is casually dating Billy Joel's ex-wife, Katie Lee, tweeting: "These latest reports are false & cruel." Russell's tweet came after estranged wife Danielle took to her Facebook page to thanks fans for their support in the wake of the couple's break-up. The blonde beauty - who recently finished second in the Australian version of 'Dancing with the Stars - wrote: "Hi Everyone! I'm sorry i haven't visited here for a while, things have been keeping me somewhat busy of late. "I just wanted to thank you all for bearing with me and also for your messages of support, it means a lot to me. (sic)"
Russell recently spoke of his upset about being away from his sons, who are currently based in Sydney. Two weeks ago he tweeted: "Starting on another film set tomorrow. I need to go home & be with my children. Cannot believe how f**ked up my schedule has become this year. (sic)"
On Wednesday (12.12.12) Russell spent the day shooting 'Winter's Tale' with his co-star Colin Farrell in the Meatpacking District of New York and he admitted the streets caused some problems with the horse riding scenes. He tweeted: "Spent the day with Colin Farrell, shooting on horseback in the meat packing district ... cobblestones and horses, fun stuff. (sic)"